(Bloomberg) -- Fast-money traders seem to have lost their stomach for betting on an interest rate lift-off in the heart of Europe. They entered 2019 with the smallest value of short wagers against German bunds in more than two years, according to exchange-traded product data. Inverse positions -- bets that pay out if the region’s benchmark debt drops -- declined for a fifth consecutive month to a notional $3.1 billion at the end of December, according to data from WisdomTree Investments Inc. The figures were down 30 percent from January 2018. The January bump in European yields and stocks belies economic indicators that show continued softness in the region, like the recent declines in French and German industrial output. Slumping production in Italy added to ominous signs. Slowing growth could keep Europe’s bond yields suppressed, counterbalancing the anticipated effects of the European Central Bank winding up its 2.6 trillion euro ($3 trillion) quantitative-easing stimulus. 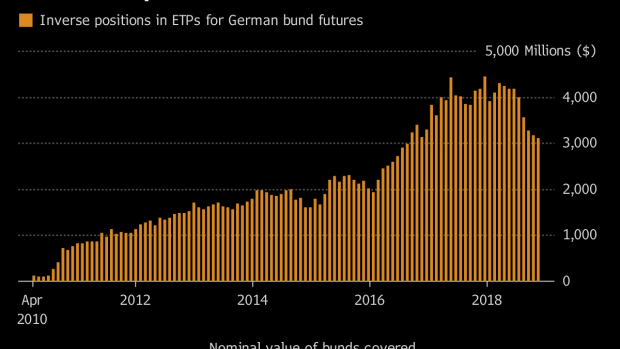 The passive products are a fraction of the size of the market for bund futures, where investors also take speculative positions. But the figures for short holdings are significant because they give a peek at a market that’s poorly covered by the securities industry. The Commodity Futures Trading Commission doesn’t publish short positions on Europe’s benchmark debt, as it does on shorting Treasuries and on the euro. --With assistance from Kevin Varley.